Surplus - What Does It Mean? 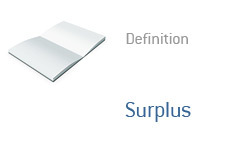 What is a surplus? What is the definition of a surplus as it applies to government spending? How rare is it for a government to post a surplus? A government can do three things over the course of a fiscal year when it comes to their budget. 1. They can post a balanced budget. 2. They can post a deficit. 3. They can post a surplus. By far, the most common of the three is #2. Most government post deficits, which is the reason why so many countries are up to their eyeballs in debt. If revenues exceed expenditures, then the government has posted a surplus. If a government brings in $2 trillion dollars in revenues but only spends $1.6 trillion over the course of a year, then they are said to have posted a surplus of $400 billion dollars. The opposite of a surplus is a deficit. In case you are curious, the last time that the United States posted a budget surplus was 2001. The amount? $127.3 billion dollars.